First-time actor Shoukath Ansari has been as much a part of the Emmy conversation as anyone, and Netflix is giving him a serious push. The thought wasn’t entirely baseless — Shoukath, the father of Aziz Ansari, certainly warrants the praise for his hysterical, honest and empathetic turn — nor was it unprompted. Netflix was holding its official For Your Consideration event for “Master of None,” and the event attracted so many people that a substantial chunk of us couldn’t even fit in the main theatre. We had to move to a backroom with a television displaying first the episode being screened and then a conversation between creators Aziz Ansari and Alan Yang, producer Michael Schur and cast members Lena Waithe and Kelvin Yu. Clearly, there’s a fervor surrounding this show — and a devout fan base for the senior Ansari family member, as well. 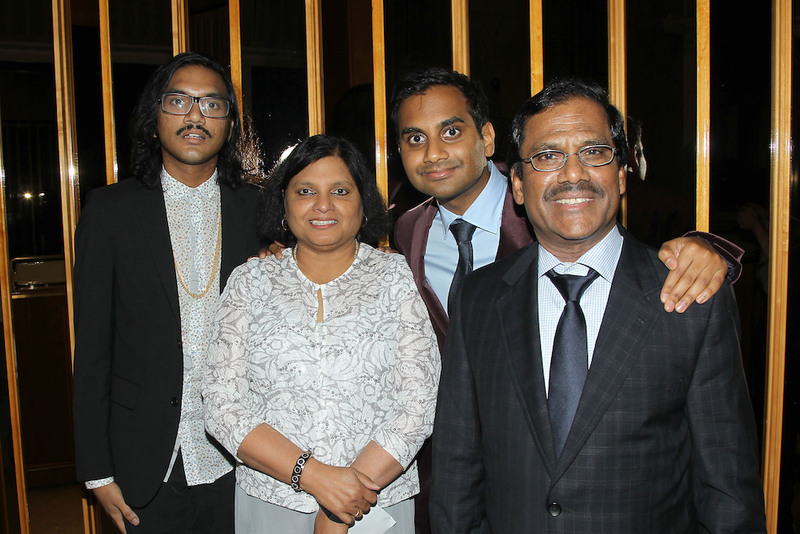 His debut in the second episode of “Master of None,” titled “Parents,” was met with much critical acclaim for both the episode and the authentic feeling captured by Dr. Ansari and his wife, Fatima — both cast as Aziz’s parents because they are Aziz’s parents. But that’s not the full story. Though Shoukath has wanted to be on TV for some time — “My dad has been asking to be on TV since as soon as I was on TV,” Aziz said during the Q&A — his son, Yang and the producers still went through the audition process for his part, seeing a number of professional actors before letting Shoukath try out for the role himself. Not only was he better for the part — Shoukath has said he beat out 18 actors for the job — but Aziz and Yang said he was able to be directed and deliver exactly what was asked of him. “We had to tone him down,” Yang added. As much is evident in the episode screened prior to their chat. “Parents” may have been chosen because of the aforementioned critical praise (and its episode placement, early in the season, makes it easy for newbies to jump right in), but it also functioned as a showcase for Outstanding Guest Actor contender Shoukath. Netflix choosing it to represent a series very much in the running for all the top comedy categories is quite telling — and great news for Shoukath. The quotes speak to Shoukath’s talents, specifically, and readers would be hard-pressed to ignore prestigious outlets like The New York Times and Los Angeles Times calling him a “scene stealer” and a “break-out star,” respectively. Moreover, billboards aren’t cheap, and the space they take up is even more valuable. Devoting an entire ad to Shoukath as a Guest Actor contender may play up the series’ inherent likability — and help it score multiple nods. But it’s also targeted for a singular, overarching purpose: Get Shoukath Ansari an Emmy nod. More recently, Shoukath was interviewed for Vulture as part of their Emmy Insider series, and writer Mallika Rao called the still-practicing gastroenterologist a “pop cultural star” because of what he’s done on “Master of None.” These kind of interviews run while nomination ballots are being submitted to remind Academy voters who to vote for, and Vulture’s series included such longstanding contenders as Allison Janney, a seven-time Emmy winner, Julia Louis-Dreyfus, who’s won four years running on “Veep” — and Shoukath Ansari. Most notably, perhaps, is that the conversation was billed as Shoukath’s first interview ever — and it was released June 25, just two days before voting closed. So does Shoukath have a shot? Absolutely. Big names typically dominate the Guest Actor category, but respected favorites have been known to sneak in if their show is well-liked. Shoukath will have to fight off Bill Murray (“Angie Tribeca”) and Liam Neeson (“Inside Amy Schumer”), as well as a slew of “SNL” hosts — Larry David, Tracy Morgan, and Fred Armisen could all be nominated — but if the Academy takes a liking to “Master of None,” as expected, Aziz may not be the only Ansari with a ticket to the Emmys this September.